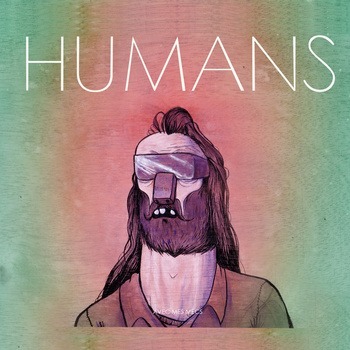 Rather Electro-Clash sounding is “Avec Mes Mecs”, by Humans. I’m a sucker for a folk singer married with an electronic backing track. For me, it’s the emotion that most folk singers infuse into their tracks that plays so well with an electronic track. So it’s not entirely true that opposites attract, but it is true that when two opposites get together, things become a lot less mundane. This is certainly what’s happened between Robbie Slade and Peter Ricq, the musicians behind Vancouver indie dance duo Humans. Their first single, “Avec Mes Mecs” brings together the big beats of Ricq’s past as a warehouse party promoter/performer and the melodic sensibility of Slade’s days as a firefighter-turned-folk musician. The track, written after what Slade calls “many days of absolutely brilliant partying” following New Year’s Eve, is a celebration of being together. With the refrain, “who knew that all we had to do was party” serving as the clarion call for all those looking to come together in a mess of bodies and smiles, Humans capture the blind, full, captivating joy of letting everything go for awhile, and giving into the fun. After these debauched days, which Slade says were “about as tame as you can be spending three days drinking without clothes,” Ricq taught him how to use a 505 Arpeggiator and side by side the two wrote out their experience to the beat. Both are most comfortable in a state of flux, leaving when the party reaches it’s peak, always trying to break into something new. “Avec Mes Mecs,” which translates into English as “with my friends,” or “with my bros,” is just one facet of Humans’ sound, which the two say is never going to be the same twice. “Just when you say ‘I think we found our sound,’ we find something else,” says Ricq. This state of flux is essential to Humans’ sound, as much as it changes it. Always listening for new songs and styles and sounds, Slade and Ricq hope to one day expand from a duo to a full band, so they can expand Humans already expansive melodies and beats even further. The future is wide open, to say the least, for two guys who always know when it’s just the right time to leave the party, and when you should just keep it going for days.